Kiehl's Australia Is Dropping It's Prices! I didn't get any pictures of the event because my sister was using the camera. So to make up for it, she took a few shots of the Kiehl's bags and products and I just had to include the one with Chloe in it! When I was about 12, I discovered Kiehl's in one of my favourite books. My favourite character used a Kiehl's leave-in hair conditioner. Being the impressionable person that I am, I immediately went on a Google rampage - determined to find this all important hair conditioner that I just had to have. Sadly, I found it. In the US. Not in Malaysia. Not knowing anything about credit cards or international postage back then, I was devastated. As luck would have it, it was around the time when I was due to leave for Melbourne. You can imagine my disappointment when I came here, all excited about finally being able to buy their products, only to realise that they were insanely expensive. I was invited to a blogger's event (my first ever!) 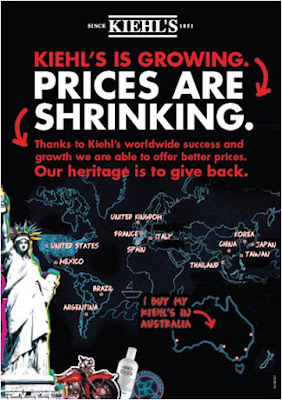 hosted by Kiehl's, where they shared with us this amazing piece of news - Kiehl's Australia is lowering their prices! We were treated to a skin consultation by the Kiehl's sales assistants, and got to take home some of the products prescribed to us. This is what I got to take home. I'll be posting a review on the moisturizer and facial cream, so watch this space! The exciting thing is, these aren't just meagre $5 price drops grudgingly effected by reluctant companies - these are real-life huge price cuts that make you want to throw your laptop out the window (goodbye, online shopping and crazy shipping costs! ), slap on some makeup, and waltz over to the counter and flash your credit card. Their Ultra Facial Cream (previously $105) is not $64. Creme de Corps (previously $89) now retails at $68. I have the Kiehl's price list, so if you want to find out if your favourite Kiehl's product has dropped in price, drop a comment in the comment box below, and I'll reply with the price of the product you're looking for.